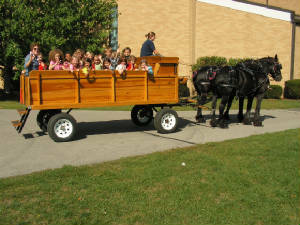 Indiana Carriage has been in business since 2004. 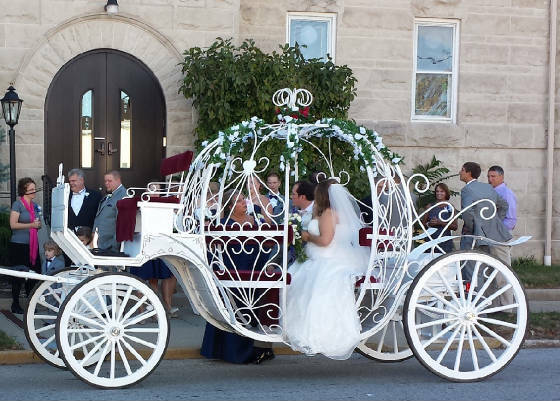 We are a full time carriage company dedicated to special events of all types including weddings, corporate functions, private parties, hay rides, sleigh rides and funeral services. 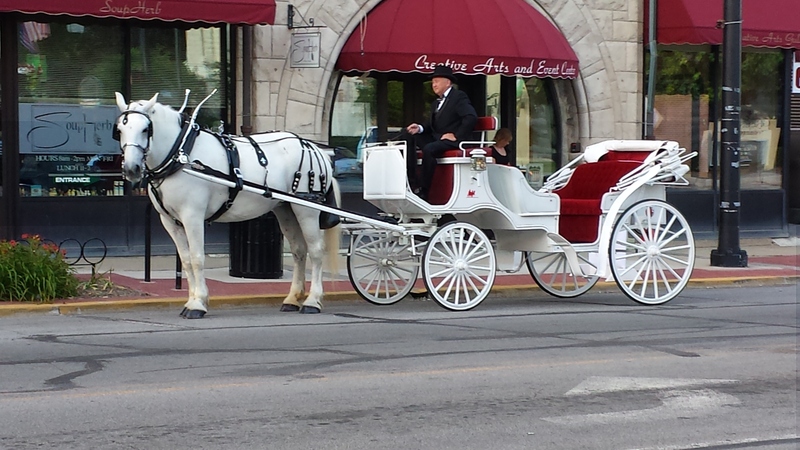 We provide horse and carriage service for weddings in the Indianapolis area and throughout Central Indiana. Our entire business is special events. 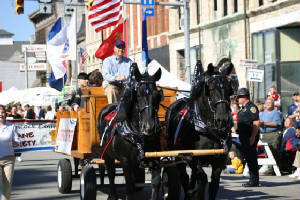 We have several horse drawn vehicles available. 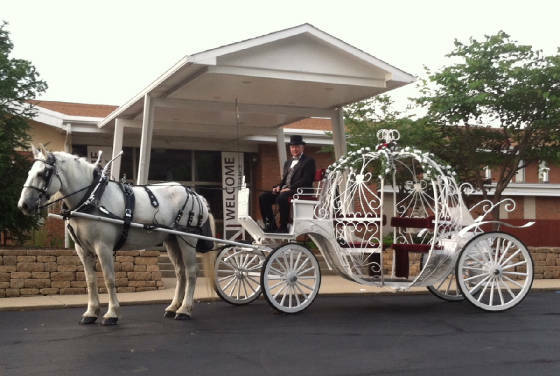 We offer the traditional wedding carriage and new this year is our "Cinderella Carriage" pulled by a white or black horse. 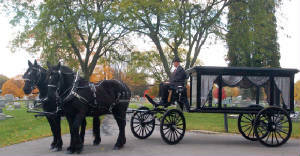 We can also provide a pair of horses for either carriage. 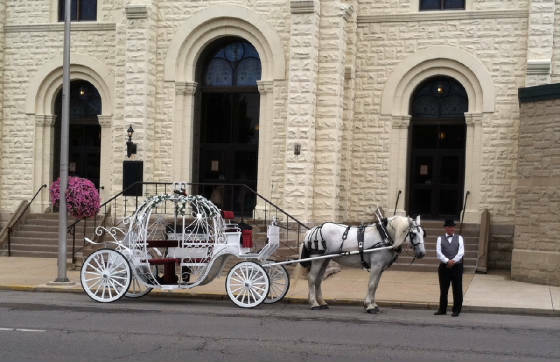 With hundreds of weddings under our belt, we understand and provide the attention to turnout and to the details that make the difference in a professional carriage service. We have been driving horses for over 30 years and are motivated by the love of driving and the joy that horses and carriages bring to people. In addition to the wedding services, we can provide wagons and vehicles that transport up to 15 people. We do many corporate events and private parties. 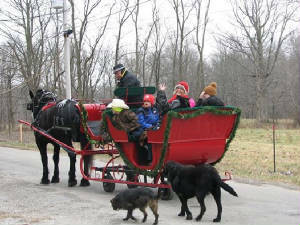 We also do many hayrides and sleigh rides in the city, residential neighborhoods and corporate sites. We have done events and festivals for several cities around Central Indiana. 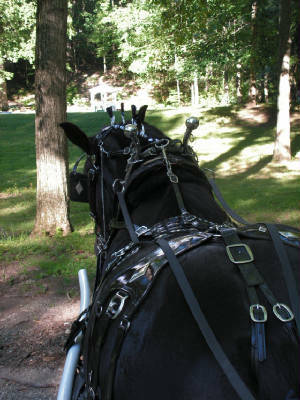 We use Percheron horses, either white or black, for their willing attitudes and sheer beauty. Our horses are comfortable in crowds and traffic. They truly enjoy their work and never work more than four hours a day. We consider our horses as partners in our work and treat them with respect and great care. Your guests will enjoy their interactions with the horses and always remember your event. Fun family or group outing. 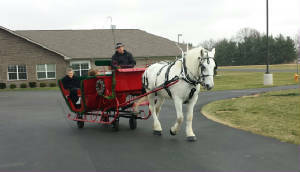 We provide horse drawn wedding carriages, hayrides, sleigh rides, funeral services and corporate events in Central Indiana including Indianapolis, Anderson, Muncie, Richmond, Columbus, Greenfield, Shelbyville, Rushville, Greensburg, Seymour, Martinsville, Mooresville, Crawfordsville, Greencastle, Brownsburg, Carmel, Lafayette, Kokomo, Fishers, Ft. Wayne and other Indiana cities. Please contact us if you have any questions about our service area. Although we specialize in weddings, as you can see, we do all types of events. Please contact us to discuss how we can make your event special. Please note: We accept cash, checks or credit/debit cards for payment. For credit/debit card or PayPal payments add 3% service fee. You can use any credit card for payment even if you don't have or don't want to set up a PayPal account. If you have trouble with the payment process, call us and we can help.